Subscription to eBay File Exchange allows you to create your bulk product listings on eBay by uploading your product feed files. For increased conversion, you’ll need to increase visibility and what can be a better way than to list more products on eBay through File Exchange. eBay seller limit is at first taken as a drawback by many new retailers. But, think it through once. Rather than uploading many products all at once and later realizing about the mistakes that you’ve done, it is just wise to create few listings, getting them to sell and gradually increasing your product listing. Targeting customers is a necessary step to increase the ROI of your business. And this holds true even when you are sending your WooCommerce products to marketplaces like eBay. When you are selling your products to the customers of the USA you need to send your products to the USA marketplace and likewise to the other eBay marketplaces. Creating your product feed for eBay marketplaces manually is not a feasible option when you are trying to increase your conversions. Furthermore, your inventory quantity may mismatch between your eBay listing and your WooCommerce shop creating the problems of overselling and such. For this, you need efficient feed creation and management tool like ExportFeed to help you focus on selling your products. 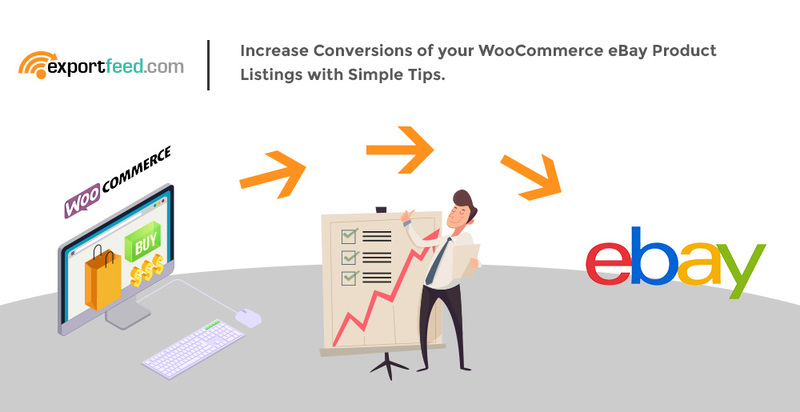 After meeting these requirements, you will be able to create your product feed for eBay to increase exposure and optimize conversions for your WooCommerce eBay listings. But if your product data on your WooCommerce is incomplete, the product feed that you create will not match the feed requirements of eBay seller. At least, you need to send the required product attributes data to eBay. So here is the information about what you can’t skip sending. Merchant_SKU: This is the SKU value of your product based on your WooCommerce store. eBay uses this value to represent your products while creating listing and order reports for you. Product_name: Product names are the title of your product on your WooCommerce store. On WooCommerce, you can follow your own set of conventions but it is best if you use Brand + Sub-brand, product name + Key product attribute + Generic product type on eBay. Product_ID: This field should contain the manufacturer product identifier such as UPC, EAN, ISBN etc of the product to exactly identify which product it is. Product_description: The products that you’ve selected to sell on eBay have multiple key selling points. You can fit up to 3 of them in the product title but you need to give a clear sense of your product to the buyers. You make the best use of this in the Product_description that you send to eBay. However, if you don’t want to use the same description on your WooCommerce and eBay listing, ExportFeed allows you to make changes using various rules. Picture_URL: The image URL of your WooCommerce store should also be sent to eBay to list your products. For this, it is a good practice that you list clear and high-quality images on your WooCommerce itself. Start_Price: By creating your product feed of WooCommerce products for eBay seller, you will make fixed price listing. So you’ll need to send your selling price by mapping it to the Start_price. Your feed management tools will grab the price information of WooCommerce to map with this attribute. Quantity: If you have managed stocks on your site, your product feed will contain the quantity of products. With a tool that offers inventory sync option, the product quantity will be synced together between your WooCommerce store and eBay seller listing. Condition: As in eBay, you can sell your used, refurbished or new products, you need to specify which type of product you are selling. Basically, if you own a refurbished store selling mobile products, you could add a preset attribute for all your products to provide a condition: refurbished value. Product Brand or MPN: You need to have either of these two values: Brand or MPN. This will help your listing on eBay to be categorized as well as improve the discoverability of your products on eBay marketplace. Shipping: Anytime a user views your products, he/she wants to know how quickly can they have it physically within their reach. This information is important and it is a general rule that products sold on eBay are shipped within 3 days. Providing this info helps in boosting the conversion and eBay has also understood it well. So, eBay marketplace has recently launched the Guaranteed Delivery program setting the 3 days as a standard. Sending your WooCommerce product feed to eBay marketplace without errors gets your products the deserved exposure that they need. Providing the required attributes is a way to avoid errors, providing the additional information about your products will get you ranked higher in eBay product search. You need to take special attention when submitting your image URL to eBay. You can use up to 11 image URL for your single product listing but they should clearly represent the product and should be in white or light grey background. Also, keep thoughts about the image size. Product titles are one of the prime factors that’ll get your product the deserved exposure and you can integrate keywords but make sure to create the titles for humans. Understand that eBay is also a product search engine with the algorithm called Cassini which works to display products that are highly likely to be sold. Not all of the product type or category have same rule to list, there are even restricted products and deceiving eBay to list and sell those products can get you out of the marketplace. Selling on eBay works almost socially so make absolutely sure to keep your customers happy by providing offers, free shipping, clear refund policies and such. Selling more products and having more satisfied customers on eBay will also help you rank higher in your eBay product search. If you are selling on eBay, ExportFeed can help to quickly create optimized product feed. Product feed created using ExportFeed will meet all the requirements to list products on eBay marketplace. If you want, you can start with the free trial plan of ExportFeed by installing the WooCommerce eBay integration plugin from here. Variable products of your BigCommerce store shouldn’t get stagnant there – here’s how to get it moving!